Penetrating injury to the diaphragm, and specifically stab wounds, have been notoriously hard to diagnose since just about forever. Way back in the day (before CT), we tried all kinds of interesting things to help figure out if the patient had a real injury. Of course, we could just go to the OR and lap the patient (laparoscopy did not exist then). But the negative lap rate was significant, so we tried a host of less invasive techniques. Remember diagnostic peritoneal lavage? Yeah, we tried that. The problem was that the threshold for red cells per cubic mm was not well defined. Some would supplement this technique with a chest tube to see if lavage fluid would drain out. And one paper described instilling nuclear medicine tracer into the abdomen and sitting the patient under a gamma camera for a few hours to see if any ended up in the chest. Groan! 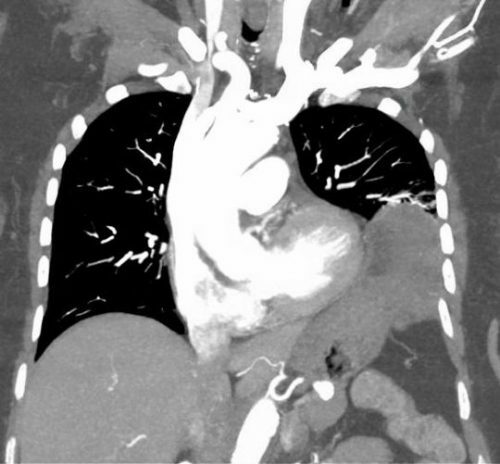 A group of radiologists and surgeons in a Turkish trauma hospital recently published a modest series of patients with left-sided diaphragm injuries evaluated by CT. They looked at about 5 years of their experience in a group of patient who were at risk for the injury due to a thoraco-abdominal stab wound. Unstable patients were immediately taken to OR. All of the remaining patients underwent an initial CT scan, followed by diagnostic laparoscopy after 48 hours if they remained symptom free. Bottom line: The authors somehow looked at the numbers and concluded that CT is valuable for detecting left diaphragm injury. Huh? They missed 7% of injuries, only finding them later at laparoscopy. And they had a 31% negative laparotomy rate. Now, it could be that the authors were using crappy equipment. Nowhere in their paper do they state how many detectors, or what technique was used. Since it took place over a 5 year period, it is quite possible that the earlier years of the study used equipment now considered to be out of date, or that there was no standardized technique. CT may not yet be ready for prime time. But it can be a valuable tool. Tune in tomorrow for some tips on how and when to look for this insidious injury. stab injuries: The role of multislice computed tomography. Injury 46:1734-1737, 2015.